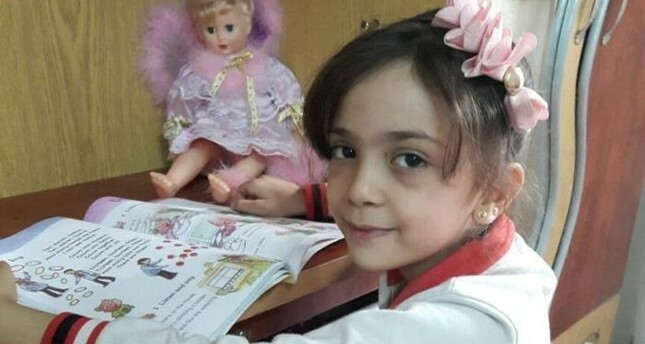 A seven-year-old Syrian girl has gained thousands of Twitter followers in just one month with her moving messages from the war-torn city of Aleppo. "We are children, not terrorists. We want to live in peace," Bana Alabed, who lives in Aleppo's Tariq al-Bab district, told Anadolu Agency. Bana's Twitter account -- @alabedbana -- has gathered more than 75,000 followers since it was created in September. In it the slight, dark-haired child tweets in English, shares photographs of her neighborhood and posts videos of herself speaking to her thousands of followers. Helped by her mother -- an English-language teacher -- Bana gives updates on the aerial bombardments which have devastated parts of her city and killed civilians. She also posts videos and pictures of her and her brother writing or reading in an attempt to distract themselves from air strikes. Bana has also directed tweets seeking help to U.S. President Barack Obama and U.K. Prime Minister Theresa May. She told Anadolu Agency she created the Twitter account to show the world how Syrian children were being killed and to draw attention to the daily struggles they faced. Since 2011, more than a quarter of a million people have been killed and more than 10 million displaced across the war-torn country, according to UN figures.